However, if you're knitting something to be worn, then part of Knitting Fearlessly is also Knitting Intelligently: Know For Whom You Are Knitting Before You Casteth On. If you're knitting for yourself, as I've said before, this in part means knowing your REAL measurements, not the measurements you fear you have! If you are knitting for someone else, however, Knowing For Whom You Are Knitting Before You Casteth On takes on a whole new meaning: Will the Other Person want to wear what you want to knit for them? This can be an especially tricky question if that Other Person you want to knit for is male. Knitting for men is always a bit of an adventure. From yarn choice (Is it a "manly" yarn? What the heck is a "manly" yarn, anyway?) to pattern choice (Is this something a guy would actually wear? Why or why not?) and right on into choice of buttons for a cardigan (plastic? metal? wood? ), we agonize and dither and wonder what we should knit for the dudes in our life. Take this survey and tell us what kind of sweaters you like. One Sweater We Know Men DO Like! 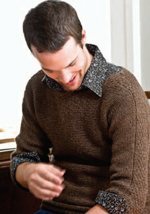 We do know, of course, that a lot of you are knitting, or planning on knitting, Jared Flood's Cobblestone Pullover for your guys (or even for yourself!). And no wonder! I've seen dozens of photos of the finished sweaters, on men of all shapes and sizes, and it simply looks terrific on everyone. Many of you have written in or called to ask if we can recommend a yarn to substitute for the now-discontinued Classic Elite Skye Tweed listed in the original Cobblestone pattern. The kind folks at Classic Elite have let us know that Renaissance, a 100% wool yarn that comes in 34 colors, works up at the same gauge as Skye Tweed, and will give a similar fabric to the original yarn. The Cobblestone pattern is now available in the Knitting Daily Store. I loved some of the comments that said you felt fearless enough to try this or that type of knitting, as long as you knew you had support. Well, that's what Knitting Daily is for, isn't it? To help provide the tools, the tricks, the patterns, and the community so that you can be as fearless as you want to be. So: Kat made a couple new Fearless buttons, including one for crocheters, and one that is a generic yarn ball in case you are multi-craftual (like me!). Get blog buttons! (Instructions and other sizes and designs are included.) Enjoy! Sandi Wiseheart is the founding editor of Knitting Daily. You can find her blogging here on Knitting Daily every Thursday. Want more? Visit Sandi's personal blog, wiseheart knits. Or, if you're on Twitter, follow her tweets: alpacasandi. FREE Downloadable eBook: Knitting Daily presents: 7 FREE Knitting Patterns for Men! 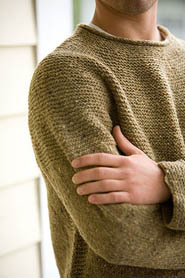 This wonderful collection of knitting patterns for men has something for everyone. The functional cable knit for your handy man, a warm knit gansey for winter days, and a handsome scarf for that extra touch. So guys, this one's for you—seven free knitting patterns for men! Download your FREE eBook Today!